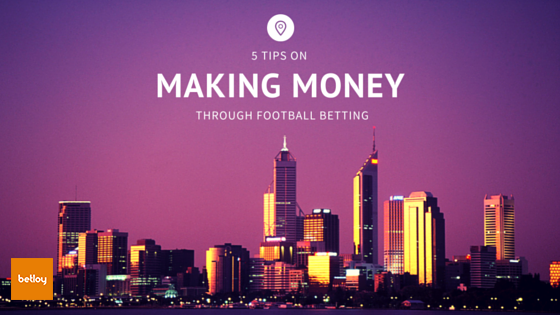 Hello Everyone, perhaps the title of this post should have been “How to make money from football betting in 5 ways“. All in all it’s still the same thing. In this post, we want to highlight a number of ways people can consistently make profits from this huge industry. It is not a hidden fact that more people lose than win in football betting. In fact over 90% of people who bet end up losing. This guide aims to help punters be among the winning 10%. This is one of the most important advice we can ever give to anyone coming into this market. We hear people say they want to pay school fees, they want to get married, they want to do all sorts with the money they hope to get when they stake a certain amount of money . But they fail to realize that like every other thing in life, Betting is also a risk. They go in with the last N100 or $10 dollars in their wallets with the hope of clinching NGN 40,000,000. At the end of the day, when they lose, they have just lost their last money and they are left in a worst state than they were in before. In simple terms, they just lost an amount of money they could not afford to lose. The right approach would be to start small and stake small. That way even if you lose the first time you can easily use your balance to make up for your losses. The concept of putting in a very little amount of money with the potentials of raking in a huge sum appears very attractive to gamblers but this is one of the major ways bookmakers cash out daily. The more games you put in a bet slip, the higher the chances of losing. Accumulators are such a funny thing because if you put 40 games on a ticket and a single match fails you have lost everything! Why give yourself unnecessary heart attack. The right approach would be to limit the amount games you stake on. 2 – 5 games is a reasonable amount of matches to stake on. Don’t be deceived by stories of people who staked very little amounts of money and won millions, those things only happen once in a purple moon. The bookmakers already have an edge over you by presenting to you odds that don’t really portray the outcome of the game. This is how they make their money!! No matter how much success you must have recorded against the bookies, bad risk management of your capital only spells doom. Ensure you split your capital into several parts. So let’s take for example you have NGN 5,000. You can divide this into 10 parts of NGN 500 each and only risk one of this per bet. This would ensure you don’t lose all your money in one very unlucky instant. Never allow gambling consume you. A lot of people develop the habit of chasing their losses after a slight losing streak. Yes, we know how painful it can be to lose your hard-earned money after a long night of research and analysis, but losing your discipline and chasing your losses is one hell of a way to completely erode your bankroll. Don’t be that guy that behaved that way that year. Sometimes take a break from betting whether or not you are losing or winning and get a life. Taking a break gives you time to be refreshed and you can come back with a healthy mind. To conclude this post, we’ll like to encourage our users to use tools that enable them increase their success rates. A mechanic with all his knowledge of cars would not be a very successful mechanic without the right tools at his disposal. So also does it apply to this industry. A good tool to use would be prediction sites. There are a good number of them available that provide well researched predictions in most sports. You can find Football prediction sites, Tennis prediction sites, Hockey prediction sites and Basketball prediction sites. Click the Button below to access our own accurate predictions provided by seasoned experts globally. What a great, well researched and eyes opening composition. With this am moving to betloy and it shall be my only reliable site for all my future bets. Hope the charges are gonna be punter’s friendly. God bless you!!! Thank you for the tips. we look forward to make more success in your daily predictions.